The security query every time you start a system tool like Regedit is annoying. Although the User Account Control can generally be deactivated, this stops Windows from warning you before starting unknown programs. You can avoid the annoying security query with a trick. 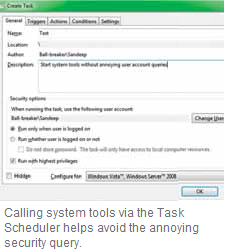 Arrange for an indirect program start using task scheduling. Subsequently, start the scheduled task using a shortcut which then does not trigger off a User Account Control, although this security mechanism remains active for all other programs. Click on ‘Start | Control Panel | System and Security | Administrative Tools | Task Scheduler’. Confirm the User Account Control query. Click ‘Create Task’ in the actions pane towards the right. Enter the name of the task in the ‘General’ tab. Activate the ‘Run with highest privileges’ option shown below. Then switch to the ‘Actions’ tab and click ‘New’. Select ‘Start Program’ and click ‘Browse’ to navigate to the desired program. You can also directly enter the call with the complete path, for e.g. ‘C:\Windows\regedit.exe’. Confirm with ‘OK’ and switch to the ‘Conditions’ tab. Here, deactivate all the set options and confirm the dialog box with ‘OK’. In the future, you will also fi nd this task in the list under ‘Task Scheduler Library’. Now, create yet another shortcut for directly starting the task. For this, right-click on a free spot on the desktop and select the context command ‘New | Shortcut’. Type the following in the input field: C:\Windows\System32\schtasks.exe /RUN /TN ?? For ‘? ?’, use the name that you have assigned to the previously defined task. Both the parameters ensure that the named task is immediately executed. Click ‘Continue’ and provide the shortcut with a suitable, preferably short name such as ‘regx’. Click ‘Finish’. If you start the Registry Editor using this shortcut in the future, there is no annoying User Account Control query. This method can also be used for other programs.